Did you know that there was once a "year of confusion"? Did you know that the computer was invented in 1822? How about that President Garfield was actually killed by inept doctors rather than an assassin's bullet? Each of these moments are covered in what are called "History Minutes," a brief two page look at a time or place in history. So I figured I would explain my "History Minutes," how they came to be, what they are, and just how they can be used in classrooms. Then, at the end, I've got a couple ways that you can try them out and see how they fit you and your students. 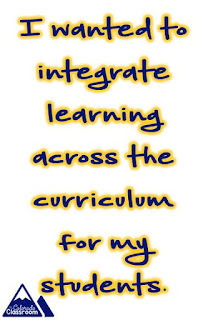 integrate learning across the curriculum for my students. That's why it's not just a social studies lesson. It's a geography snapshot, a close reading activity, and a math or science lesson, all centered around one central theme. At my school we were constantly looking for ways to integrate material between the language arts teacher and the social studies teacher. Or the math teacher and the science teacher might be finding new ways to hook up and teach cooperatively, so I wanted to create something that was already geared towards that integration. I also just love the true stories of history. Forget the names and the dates and the memorization of facts, just tell me a story about people and connections and how one thing can forever change the world, and I'm mesmerized. So in my "History Minutes" that is what I attempt to do. I try to hook students with the interesting stories that haven't been told. I try to connect them to places by showing them what's cool or different that they maybe didn't know. Every "History Minute" runs around 30 pages when you count the answer keys. That might seem like a lot for a "Minute" but there's a couple reasons for that. One, is that integration piece. I wanted to include the various pieces for the various subjects. But two, is that the story is from a moment or a minute in time, not that it will take you just a minute to complete. Here's a typical run-down of a "History Minute" packet. For instance, in "Slavery, Snakes, and a Saint" students will read a 2-page story on the real life of Saint Patrick, who was never actually a saint. They will then examine the main idea of what they just read, further explore the vocabulary that challenged them, and answer a page of comprehension questions as well. Next up - support the idea with textual evidence, a great pre-cursor to standardized testing, and then delve into a writing prompt about metaphors. 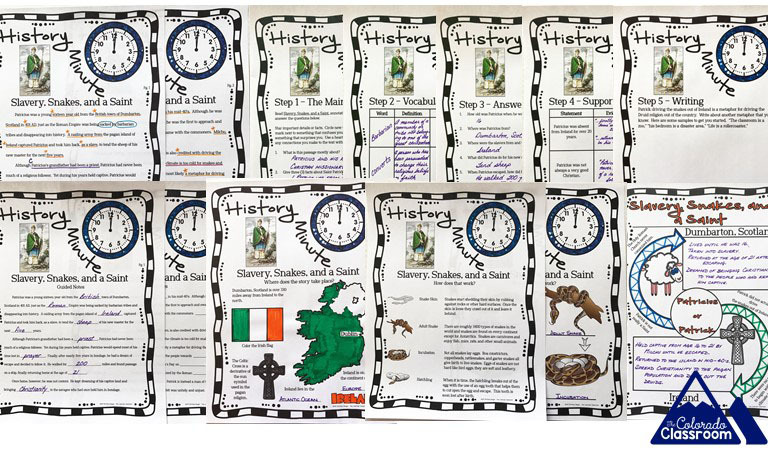 Also included are guided cloze notes over the reading, a geography sheet on Ireland, a science lesson on the life cycle of snakes, and some fun notes which I've entitled "Smart Scribbles" that get kids taking notes and doodling at the same time. "History Minutes" allow you to cover a history topic in as brief or as in-depth a way as you would like. Don't have a lot of time? Just read the 2-page story. Want to get in depth on Stonehenge and the Neolithic Age? Complete the 5-part close reading activity and then explore the magical ratio of pi with circles and polygons. Want to split the work with a co-worker? You take the close reading section while you allow a colleague to work with students on the geography and science lessons. Spend one class period on a topic, or spread it out, and use just five minutes at the start of each day, as a bell ringer, to cover a piece. 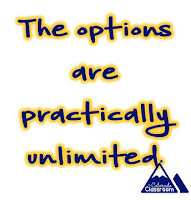 The options are practically unlimited. A "History Minute" can also be used in a bevy of different facets depending on the needs of your class and the time you have as a teacher. First of all, they are great to take and integrate into your unit lessons. For instance, take "The Calendar Under Roman Rule" and add it to your teachings on Julius Caesar. Who isn't going to know him for the crazy, mad dictator that he was, when they hear about the year of confusion? If you don't teach lessons about South Africa, its colonization by Europe, or the diamond mines...then place "The Cullinan Diamond" in a station used for rotations or extra credit. Students will have access to another point in history they might not have gotten to learn about, and you've got another work center for students to visit when they need a time out, when it's time to rotate through stations, or when they just need a new and different activity. 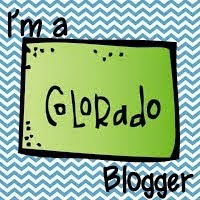 Best yet...if you're going to be absent and need something simple for your sub to do? Pull out a "History Minute." Have your students explore the life of Marie Curie or learn about the Columbia Shuttle disaster. It's all at their fingertips and with the answers included, it should be virtually foolproof for any sub to accomplish when you're absent. So now that you've made it this far, the real question is how do I try one out? Well I have a couple of possibilities for you. First of all, I've made a shortened sample of a "History Minute" on Machu Picchu. Although there is a full length packet available, this will give you just a quick taste, as it's been cut down to one-third the size of a normal packet. And if you want a full packet, you can enroll in my bulletin. By subscribing, you will receive "Murder or Malpractice?" for free in your third issue, about ten days after you join.